Mitsubishi Electric comes in as an inverter. Inverter are generally energy saver. 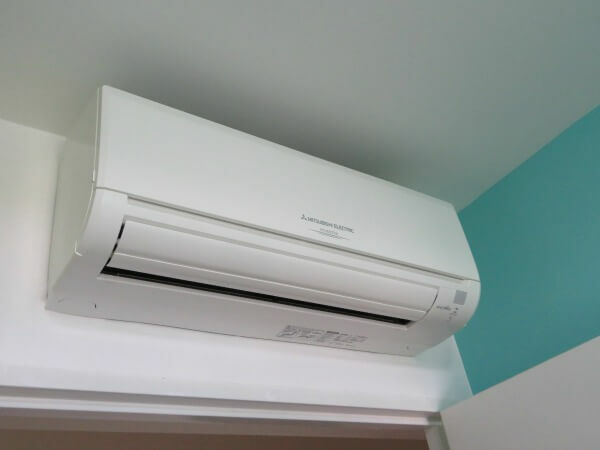 Upon turning on the air conditioner, the air-con system will go full power to reach the set temperature. You can hear a bit of noise on the blower, but soon subside when it reach the desired temperature. The air conditioner system did not turn off like a non-inverter type. Instead, the air-con inverter type will turn in a lower speed to keep the same desired temperature. This saves more power than those non-inverter type, which draws more power switch on and off. However, even Inverter air conditioners need servicing. It is the only way to keep them going. Dirty filters and filthy coils tend to block the heat transfer and restrain the air flow in the air conditioner. It also caused the sensor to detect the temperature not there yet, and thus continue to draw more power than usual. You can see your electric bills going up in the long run. It might be insignificant for now. How about not cleaning the air conditioner for a year? What do you think will happen? It might still be working, but this time it takes longer time to reach the desired temperature or even never going to be there. More power drawn to sustain the air conditioning, thus higher electric bills. More wear and tear might cause the air-con system to show signs of failure. Aircon not cold enough, aircon water leaking, aircon smelly and others are issues that you do not favour. These issues cannot be ignore. They are symptoms or pre-warning to parts failure within the air conditioning system. Well, everything will fail one day. But why fail sooner? Air conditioning system is part of an asset in a property. They are likely to cost a few thousands to install. An aircon can have a lifespan of 10 years or more, provided that you take care of it. No maintenance air conditioner might not last longer than 5 years. That is if you want to change new after 5 years or even earlier. However, we have not incurred all the repair cost if they breakdown during this period. Replacement parts are expensive. • Aircon Cleaning – cleaning aircon filters and vacuum aircon evaporator coils. • Aircon Chemical Wash – flushing out the dirt in the evaporator using permitted chemical. • Aircon Repair – troubleshooting, failure analysis, part replacement and function test. We want to deliver quality service. We want to be entrust by many of our customers to get the job done. We have been doing these aircon servicing for many years. If regular servicing is important to your air conditioning system, we have the affordable package. Please contact us now! We are also providing aircon services for brands like Panasonic, Toshiba, Daikin, Carrier, Sanyo, Samsung, LG, Hitachi, National and more.